From the moment that Gun Media revealed Friday The 13th: The Game, we’ve all been wondering about the gameplay specifics of their 7v1 asymmetric multiplayer will play out. During the Kickstarter Campaign the team provided us with pre-alpha footage of the game in action, however this merely whet our appetites leaving us wanting more. Last night Gun Media revealed their first gameplay overview video, hosted by Adam Sessler, providing brand new insight into how the players will spawn into map at the start of a match. Friday the 13th: The Game has met its goal of $700,000 to successfully fund development of a bigger and better project. The team at Gun Media, IllFonic and the horror industry legends of Tom Savini, Harry Manfredini, Kane Hodder and Sean S. Cunningham are elated to realize the vision that is Friday the 13th: The Game! This has been a truly whirlwind week for the team behind Friday The 13th: The Game, just 6 days ago they still needed more than $80,000 to Unleash Jason and make the game a reality. However with 60 hours left on their Kickstarter Campaign they’ve not only managed to fund their baseline goal of $700K, but they’re currently $10,618 away from their first Stretch Goal which will unveil the “Mirror Smash” environment kill within the game. As we’re quickly approaching the, Friday November 13th, Kickstarter campaign deadline for Friday The 13th: The Game, they’re still $14,995 away from their $700,000 funding goal to #UnleashJason. At the start of the campaign it appeared as if they would’ve reached their goal within the first 2 weeks, every time I checked the counter it just kept climbing at a meteoric rate. Unfortunately, like most crowd funding campaigns, the second week brought with it a rather dramatic slow down in the volume of pledges coming in. However the pace at which the fans were coming out to show their support and back the campaign has kept them right on track to achieve their goal. At this point there isn’t any concern as to whether or not Gun Media & Illfonic will hit their goal, its really just a matter of time. Reaching their goal will ensure they’re able to deliver a terrifying, 1v7 asymmetrical multiplayer, Friday The 13th experience. However there is still so much more that the team wants to accomplish, within their Stretch Goals, in order to deliver the complete fan experience that they’ve had in mind. Among the list of their goals they’ve planned; some of the most memorable kills from the franchise, a single player campaign that’ll allow you to alter history by reliving iconic scenes from the series as either Jason (with a 1st person point of view) or a counselor, and of course there’s also the ability to play as the original killer… Jason’s dear ol’ mother. Even though the team has said they’re considering the possibility of developing the Stretch Goals to become DLC down the road, but there aren’t any guarantees that it will happen. Right about now you might be asking yourself if there’s a possibility that they’ll become DLC, why should we fund the campaign beyond the $700K goal? With only 8 days left on their Kickstarter Campaign, Gun Media & Illfonic are getting so damn close to achieving their $700K goal. However in order for Friday The 13th: The Game to become a terrifying reality, they still need the support of the community to help raise the remaining $80,837 before the time runs out… Of course there is more than one way to show your support, you can choose to back them on Kickstarter and/ or take to social media to ensure all of your friends, family members, and even your co-workers know that you’re looking to recruit them in the effort to #UnleashJason. With that being said the team wanted to be sure you had plenty to talk about when sharing your excitement, so they’ve posted a few new updates this week that’ll surely help you get others onboard. Among the updates you’ll find a new in game trailer highlighting Camp Crystal Lake, roundtable discussions with the dev team at Sean Cunningham’s house, and new campaign reward options. I hope you all had a safe & happy Halloween yesterday, hopefully you’re not all suffering from sugar induced hangovers today. It’s no secret that I’m a self proclaimed horror fiend, so it shouldn’t come as a shock that I’m thrilled by the prospect of Friday The 13th: The Game becoming a reality. However in order for the nightmare of every camp counselor to rise from the depths of Camp Crystal Lake, Gun Media is relying on the fans to #UnleashJason on Kickstarter. The campaign has been live for 11 days, however thanks to the 7,592 backers and all of the fans that have been keeping the conversation alive, they’ve managed to break the $500,000 barrier bringing the team one step closer to their $700,000 baseline goal. Hitting the $500K mark not only means that the team is one step closer to making Friday The 13th: The Game a reality, its also the threshold in which Gun media was going to reveal the first batch of their stretch goals. Last week I was thrilled to share the news that Gun Media will be taking us back to Camp Crystal Lake in 2016. For the first time since the 1989 NES classic, horror fiends and gamers alike will be able to immerse themselves in the terrifying world of Friday The 13th: The Game for PS4, Xbox One, & PC. However the team is taking a completely different approach than it’s side-scrolling predecessor, Gun is developing an experience that’ll leave you feeling as if you’re actually a part of the iconic horror franchise with an online 1v7 asymmetrical multiplayer approach. In order to create the definitive Friday the 13th experience, they knew they’d need to engage the fans to ensure Friday the 13th: The Game lives up to the same standards that they’ve have come to love from the film series. Their Kickstarter campaign will allow them to create a gaming experience that’ll be scary as hell, while bringing the brutal violence and gore that the fans deserve. Whether you’ve already backed the campaign or you’re still on the fence, I’m thrilled to share with you an exclusive Q&A with Wes Keltner, Co-Creator of Friday the 13th: The Game, where we take a moment to talk about the early stages of development, in game features, and the Kickstarter. Hopefully we’ll answer a few questions that you’ve been asking, if not you’ll find that the Kickstarter page is still going to be your best resource for in depth information. 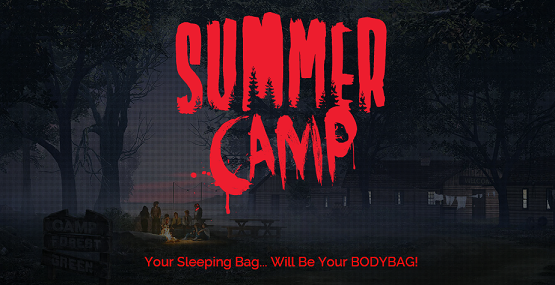 The Summer Camp announcement caught the immediate attention of gamers and horror fiends alike, instantly instilling hope that Gun Media would be the ones to finally bring the slasher/ splatter genre to life in an entirely new horror gaming experience. Among the fans that found Summer Camp to be intriguing was Sean S. Cunningham, creator of the Friday the 13th franchise. Because of the potential Sean saw within Summer Camp, he approached the team earlier in the year to begin a conversation that would ultimately lead to the death of Slasher Vol. 1: Summer Camp as we knew it at the time. Sean instantly recognized the passion Gun had for the project and the Friday the 13th source material, so much in fact that they decided to work together and overhaul Summer Camp to make the game they’d been dreaming of all along. For the first time in more than twenty-five years, Friday the 13th is returning to the video game world. Gun Media and IllFonic, in partnership with Crystal Lake Entertainment, are proud to announce that Friday the 13th: The Game is set to launch next Fall, 2016. Ever since I was a kid, I’ve always had a bit of a sift spot for the Friday The 13th series. As much as I enjoyed the campy greatness that was the original Friday The 13th, it wasn’t until the ending that I realized how great it really was.